I was in New Hampshire last week. *Live Free or Die* is the state motto. You can read about it above. I’ve already blogged once today, but I need to just comment on this lack of rules, boundaries, laws. I’m from California. We have laws regarding most everything, which I think is good, due to the fact that we sort of push the edge of the envelope, and think WE know what’s best. I do have to say one thing though. They seem to have caught on with the No Smoking thing, so it’s not really Live Free or Die, it’s just live free, then die. But don’t smoke here or here. Usually when I travel, I forget that everyone smokes. That the non-smoking room in the hotel, is usually *smelly*, in that someone is smoking next door. However, in New Hampshire, I didn’t get that. Even though you CAN smoke there. 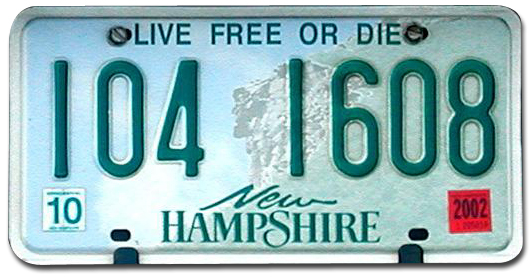 They call New Hampshire the FREE state. I loved it. Our extended family spent a few 4th of July holidays in Maine. We’d fly into Boston, rent cars and drive north. A couple of times, my brother-in-law stayed the night in New Hamster (that’s what my younest called it then) just so he could light copious amounts of fireworks in the streets. “Live Free, or Die” still is stuck in my brain. I’m just glad we survived it. This was posted on the post below from my pal Monandeclan. oh come on V– any state that have state liquor stores on BOTH sides of the major highway in the state has some FREE in it. Too bad the Man in the Mountain collapsed three years ago… he died. God bless NH.